18 Nov 2016 / 19:30 H.
THEATRE productions that are aimed at the young are few and far between on our local stage. 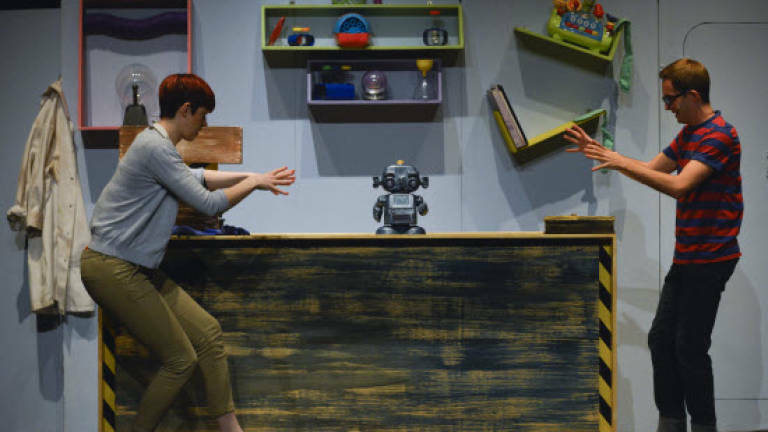 But in recent years, Gardner & Wife Theatre – a Malaysian theatre company founded in 2000 by Chae Lian and ­Richard Gardner – has been playing a vital role to bridge this gap by bringing in plays from overseas catering specifically for children and teens. 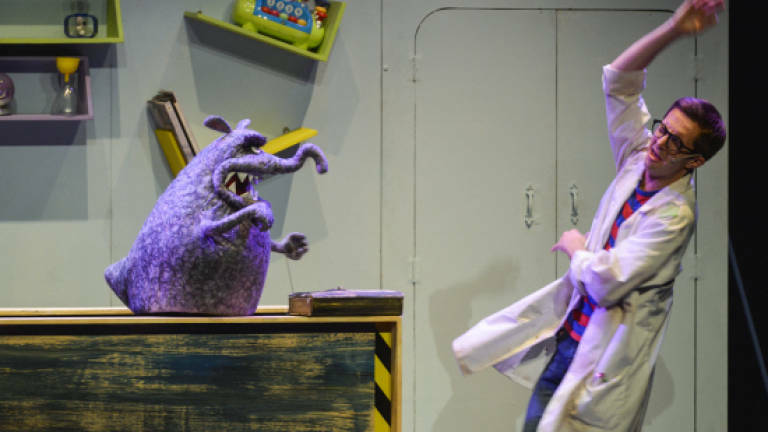 The latest production ­presented by this husband-and-wife team is Monstersaurus which is currently playing at PJ Live Arts in Jaya One, Petaling Jaya, till Nov 20. 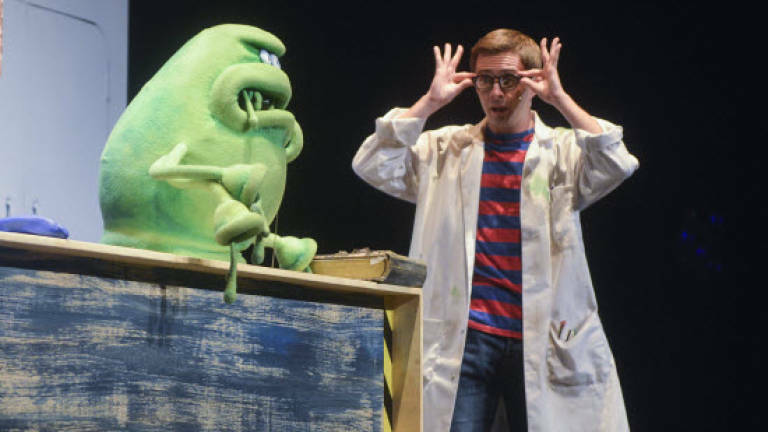 Staged by the Big Wooden Horse Theatre Company from the United Kingdom, the show is an adaptation of a book by award-­winning author Claire ­Freedman and ­illustrator Ben Cort, the creators of ­popular book series ­Aliens Love Underpants. Monstersaurus centres on young Monty, who is an ­inventor. But his creations do not always work. His walking toaster runs away, and his robot goes berserk. Then, he stumbles upon a book on how to create ­monsters. He creates a monster called Bonglob and later, another monster named Dusty. Unfortunately, the two monsters have gone into hiding in his room. Monty now lives in ­constant fear that his mother, Mum (played by Sophie Steel), will find out about the monsters he has created. So he decides to create ­another bigger monster called ­Monstersaurus who manages to help him get rid of ­both Bonglob and Dusty. The two then form a special ­friendship. ­Monstersaurus even ­introduces Monty to his ­family. The story teaches that ­differences should not stop you from making friends. Big Wooden Horse Theatre Company is known across the UK and abroad for its high-quality theatre performances for younger ­audiences. The company believes that young people deserve the highest quality of writing, performance and production that a professional theatre company can offer. This is evident in Monstersaurus. 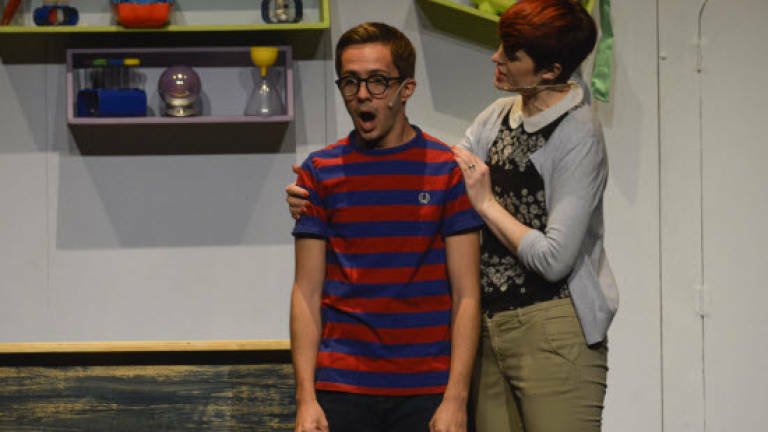 The play has humour, ­music and dance, and the actors also succeed in getting the young audience to ­participate actively in the play. 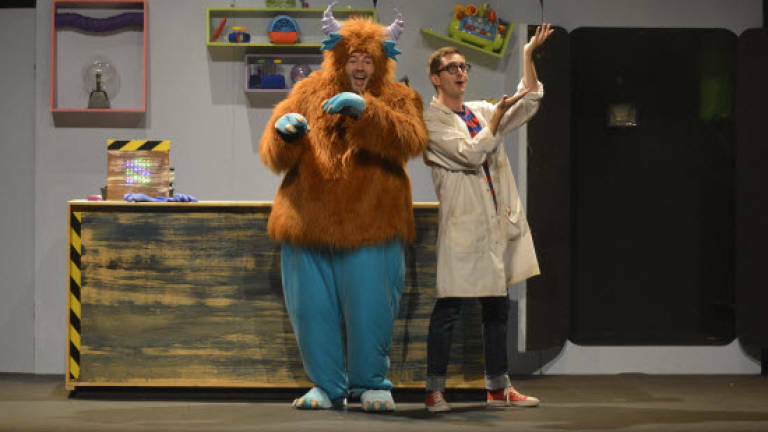 The monster puppets, Bonglob and Dusty (voiced with gusto by Mark ­Collier), are cute with each monster coming across with its own ­personality. Collier also takes on the costumed role of ­Monstersaurus. Monty is brilliantly played by Harrison Spiers, who manages to bring a sense of innocence to his character with his child-like ­mannerisms. His performance is amazing to watch. Even the cute monsters cannot ­overshadow him. The show lies directly on his shoulders and he delivers a masterful performance. The interaction between the puppets and human ­actors is also interesting to watch. The show is lively, and I must say the joyful feelings it invokes are infectious. You can feel the energy moving from the stage to the crowd. Everyone in the audience, even the adults, seems to be enjoying the show. If I have any ­complaints, it’s that the show is just too short. However, this ­weakness is easily ­overlooked. Suffice it to say that the ­children leave the theatre hall with big smiles on their faces. Like the children, I too, walk away from the show with a smile on my face. So catch the play before it finishes its run on Nov 20. For more, visit the PJ Live Arts website (www.pjlivearts.com).